diversional activity deficit deficient diversional activity. fluid volume deficit deficient fluid volume. hearing deficit hearing loss; see also communication enhancement: hearing deficit. knowledge deficit see knowledge deficit (specify). oxygen deficit a lack of oxygen, as in hypoxia, anoxia, or insufficient oxygen delivery in comparison to oxygen consumption. 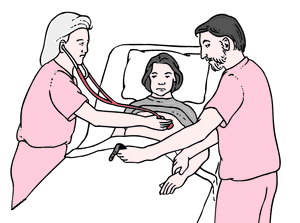 pulse deficit the difference between the apical pulse and the radial pulse, obtained by having one person count the apical pulse as heard through a stethoscope over the heart and a second person count the radial pulse at the same time. Assessing the apical-radial pulse to identify a pulse deficit. From Lammon et al., 1995.
reversible ischemic neurologic deficit a type of cerebral infarction whose clinical course lasts longer than 24 hours but less than 72 hours; brain imaging usually reveals an infarct. See also stroke syndrome. self care deficit any of a group of nursing diagnoses approved by the North American Nursing Diagnosis Association, defined as impaired ability to perform basic self care (activities of daily living) in the areas of feeding, bathing/hygiene, dressing/grooming, and toileting. Related factors include diminished strength and endurance, pain or discomfort, impaired mentation, neuromuscular disorder, depression, and anxiety. The defining characteristics for each functional level are readily observed and graded on a scale of 0 to 4. The suggested code for functional level classification is as follows: 0, Completely independent; 1, Requires use of equipment or device; 2, Requires help from another person for assistance, supervision, or teaching; 3, Requires help from another person and equipment or device; 4, Dependent; does not participate in activity. self care deficit, bathing/hygiene a nursing diagnosis defined as impaired ability to perform or complete bathing/hygiene activities for oneself; see self care deficit. self care deficit, dressing/grooming a nursing diagnosis defined as impaired ability to perform or complete dressing and grooming activities for oneself; see self care deficit. self care deficit, feeding a nursing diagnosis defined as impaired ability to perform or complete feeding activities; see self care deficit. self care deficit, toileting a nursing diagnosis defined as impaired ability to perform or complete one's own toileting activities; see self care deficit. speech deficit speech disorder; see also communication enhancement: speech deficit. visual deficit partial or complete blindness; see communication enhancement: visual deficit. The result of consuming or using something faster than it is replenished or replaced. oxygen deficit see anoxia, hypoxemia, and hypoxia. pulse deficit the difference between the heart rate and the pulse rate in atrial fibrillation. reversible ischemic neurologic deficit (RIND) a type of cerebral infarction whose clinical course lasts between 24 and 72 hours. any deficiency or difference from what is normal, such as an oxygen deficit, a cause of hypoxia. The result of consuming or losing something faster than it is replenished or replaced. a lack of oxygen, as in hypoxia or anoxia. A. what you describe here is pretty harsh numbers. very very low hemoglobin, low platelets level...have you checked for white blood cells? i recommend seeing a Dr. ASAP. with these numbers there is a good chance that you'll bleed from places that are not supposed to bleed. Q. Recently I came to know after a test that I am vitamin D deficient so how much vitamin D should I take? I am 26 yrs old and I have fibromyalgia. Recently I came to know after a test that I am vitamin D deficient so how much vitamin D should I take? A. what is a normal level of vitamin d for a 65 yr old woman? A. hypothermia can be caused by al sort of things. Some bacterial infections, poisoning, aciduria , hypothyroidism and more. Is this the only symptom? I’m sure there are some others. But I think this could be a good idea to check up with a Dr.
By contrast, as cyclical deficits mount when the economy contracts, the contemporaneous decline in private sector demand for loanable funds will mitigate the financial market pressure on interest rates and may moderate or even eliminate any monetary response required to stabilize interest rates. Cyclical deficits, or the state of the macroeconomy, would then dominate the Fed's decision making when it conducts monetary policy. Further support for this position is provided by similar results in (2) through (4) of Table 2 in which structural deficits are included in the regression with cyclical deficits and its decomposition into left- and right-wing cyclical deficits. Structural deficits occurring under Democratic presidents and cyclical deficits are significant at the 10 percent level in (4) of Table 3. Results of a test of the hypothesis that the Fed responds differently to cyclical deficits (or more generally, the state of the economy), depending on which party controls the White House, is found in (3) of Tables 2 and 3. As previously mentioned, they observe a uniform Fed response to structural deficits and a stronger Fed reaction to cyclical deficits occurring under Democratic administrations as compared to the response under Republican administrations.